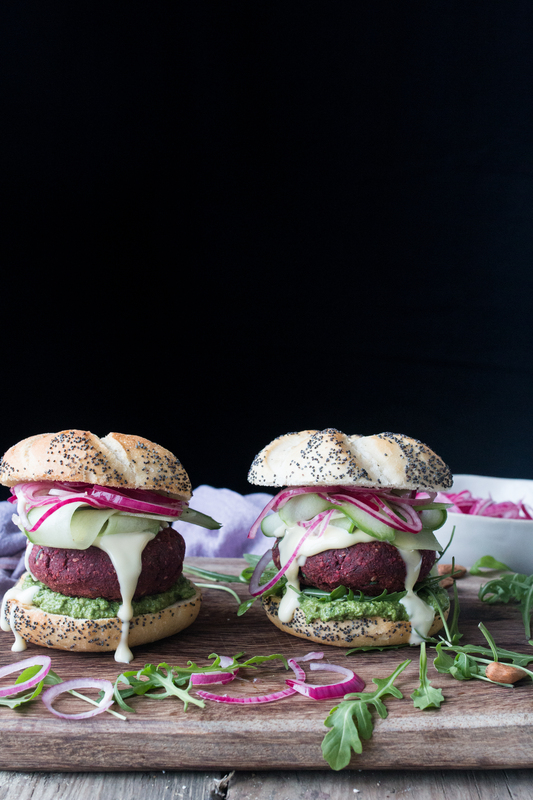 Vegan Beetroot and Bean Burgers. Recipe adapted from Sam Murphy's new book Beatifully Real Food. Like any good burger, you can add the toppings you like. But, the ones listed below work SO well with these burgers as they add lots of moisture, which these burgers need! In a large bowl, mix the almond meal and oatmeal until nicely combined. Chop the beetroot into small chunk and, together with the black beans, blend in a high speed blender until a thick puree is formed. Add this puree as well as all the other patty ingredients (except the oil for frying) to the oat and almond mixture and stir until nicely combined. If the mixture looks a tiny bit too dry, feel free to add another tablespoon of olive oil. Shape the mixture into 8-10 patties and put in the fridge for about 45 minutes so the mixture sets and holds together. As the patties are chilling in the fridge make your walnut and kale pesto by combining all the ingredients and placing them in a food processor or high speed blender. You can also use a handheld blender as I did, if you prefer. Taste for salt and adjust as needed. You can store the pesto in the fridge in an air-tight container for up to 4 days. Next make the quick pickled red onion rings by peeling the onions and then cutting them as thinly as you can. Place the cut onions in a small bowl and cover with white wine vinegar. Add a few tablespoons of sugar and stir. Taste and add more if need be. Set aside. When you are ready to prepare your burgers, preheat the oven to 160-170C (325-350F). In a large frying pan, heat up the frying oil. Pan fry each patty for 2-3 minutes on each side until crispy. Transfer the patties to a lined baking tray and place them in the oven for about 10-20 minutes. Finally assemble the burgers and enjoy! Vegan Burger creation by The Little Plantation. Check out more plant-based recipes and amazing photos here. Kimberly is a nutritional therapist, yoga teacher, self-taught food photographer, food and prop stylist and a recipe developer.